One of Tuscany's most fascinating cities, Lucca remains a center for commerce and culture on a much more intimate and manageable scale than Florence. Still protected by a wall that originated with the Romans, its pedestrian-friendly streets make it an ideal place to walk, shop, and people watch. The wall surrounding the city features a 2.5 mile promenade for walking or cycling that offers superb views of both the city and the surrounding countryside. Piazza San Michele, in the center of town. The church originates from the year 735AD. The current facade was built in the 13th century. The Torre Guinigi dates from the 1300s and has an impressive garden at the top which is open to anyone who wishes to climb the stairs! 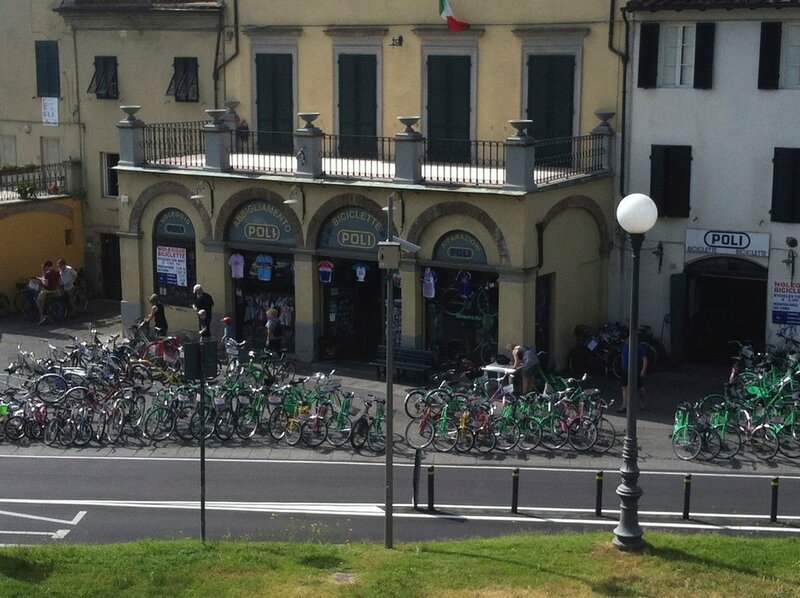 Bicilette Poli, located in Piazza San Pietro, rents bicycles for touring the city and sightseeing along the top of the wall. The promenade on top of Lucca's walls, approximately 2.5 miles around, is a beautiful walk in any season, offering amazing views of the city and surrounding mountains.